DMLS (Direct Metal Laser Sintering, also known as DMP or Direct Metal Printing), & SLS (Selective Laser Sintering) production worthy parts are making a huge impact in the Aerospace & Defense and Heavy Machinery sectors. The unsung heroes of the additive manufacturing world are certainly those which allow for complex internal geometry unachieveable in other traditional manufacturing processes. The most likely candidates are small metal parts that could be improved by adding features that are otherwise impossible to create. Parts under about an inch in size in any one dimension have become the front runners for getting the most out of what DMLS offers. Think nozzles, plugs, custom threaded hardware, electronics assemblies, lighting, and replacement micro parts no longer sold by OEMs. Historically, parts requiring undercuts, complex internal channels, and other features are difficult to achieve via CNC Machining and Injection Molding or Casting. These components often involve multiple parts built with a variety of processes with the end parts requiring manual assembly and fabrication. Outside of costs, each time an additional step or human touch is involved; precision is decreased, even if by just a small amount. The process of transitioning a multiple part assembly into a single 3D printed part is known as Part Consolidation. A very rudimentary example is the keychain that’s likely in your pocket or sitting in your top desk drawer as you read this. Everyone’s key collection is different and is essentially an assembly of unique parts and components, that when combined, serve a very specific purpose unique to each person and his/her car, home & office. 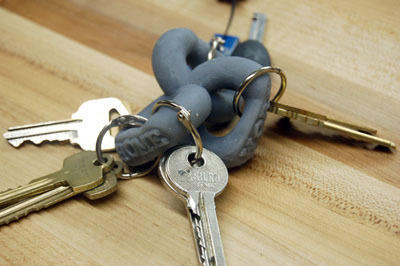 Each key blank is CNC machined either at the factory or at your local hardware store, then added to your key ring and held together with a stainless steel or aluminum ring, carabiner or clasp. Now imagine designing a keychain from scratch ignoring all the usual restrictions of traditional manufacturing techniques. Keys and key chains are ubiquitous and their purpose universal, so in this example, Part Consolidation isn’t practical (yet? ), but consider the specificity and high costs that typically apply in the Aerospace or Heavy Machinery industries. Complex ducting, purpose-built tubing & brackets, support structures and the like are all candidates for further analysis. Take a look around at your team’s typical development process, and consider what end components are candidates for Part Consolidation. Chances are, you’ll benefit, and costs and lead time will see a welcomed decrease, or at the very least, the conversation will get the gears turning on how these principles can be applied on future endeavors. About the Author: Bill Artley is the Vice President of Operations at PrintForm and has written many articles & white papers on product development, sourcing, additive manufacturing, and materials. He is a contributing author and peer reviewer of The 3D Handbook (http://a.co/h9fL1b5), a top 10 Amazon Best Seller in its category.